I’ve been away from the blog for the past several days.Â Last week I was down in Philadelphia working with a fighter for an ESPN2 bout.Â It was great to be in Philadelphia.Â We visited Joe Frazier’s old gym, made another trip to the Rocky steps, and visited the legendary Blue Horizon arena.Â It was shaping up to be a great boxing week…Â that is until we returned home on Saturday the 11th. With just a few hours of sleep since the fight the night before, I hopped online after a long ride home.Â Â I was planning to check my email briefly before catching up on some much needed rest.Â Unfortunately, neither of my plans panned out.Â I never made it to my inbox and I didn’t catch up on any sleep. When I hopped online, I immediately read that Arturo Gatti had been killed.Â I was shocked to read such terrible news.Â Anyone with any interest in the sport of boxing has had their share of excitement during an Arturo Gatti fight.Â He wasn’t the most skilled fighter or our era, but he was arguably the most exciting.Â Â Gatti gave his fans a show every time he stepped inside the ring.Â He had as much warrior in him as anyone you’ll ever see. It’s terrible to see anyone have their life cut short at the young age of 37.Â We may never know what really happened or why it happened, but I do know that Gatti inspired countless fans around the world.Â I still remember jumping up and down during his first of three epic bouts with Micky Ward. Gatti highlights could easily fill an entire DVD, but here is one of the best videos you can find online. 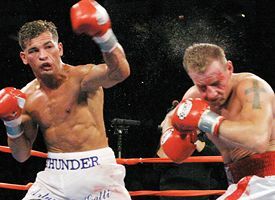 As a Canadian about Arturo Gatti’s age, I watched several fights of his. He was a great tough fighter, mentally and physically, and was one of the most interesting to watch boxers ever. And I’m no longer even a big boxing fan. He made an impact that goes beyond his sport in this fan’s memory. THERE WILL NEVER BE ANOTHER GOTTI. R.I.P. Amazing fighter. The second clip is unbelievable. The punishment he took, then proceeded to give back, is beyond words. How can this toothpick of a wife strangle Gatti? I don’t get it. He fought guys that were 1000X stronger than this broad. Jimmy – From what I read, I believe it happened when he was asleep (or passed out). I’ll try to find the news article that made such a reference. A true warrior and inspiration to all. Great fighter shame to see him go.